OOTD: A sculpture of water and unsettled dust. I finally found a way to at least take -semi-decent outfit pictures. I am dying to take some good ones but in this dark and really small dorm room I am restricted to the small space that I can work with. 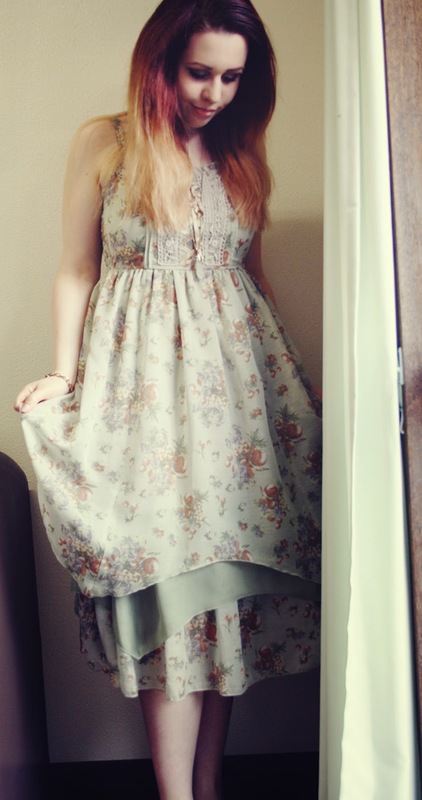 Today I finally wore the dress from Axes Femme that I fell in love with on my way home from the Tsukuba City Hall. It was a pain to take these pictures. I literally only have this small corner to take pictures. I could try take some on my balcony but my balcony also doesn't really look as nice as it could so I actually prefer the plain wall with bits of my bed to be totally honest with you. Maybe I'll come up with a better solution in the future but that's all I can offer at the moment ._____." While I love this dorm it is absolutely not made for blogging. Will try to convince Nicola to take better pictures of me, that dress deserves actually a lot better quality than what I can offer. Meh. (Btw; I absolutely love the print; I am SO happy there are not roses on that dress. Roses are everywhere in Japan.) I also absolutely miss all my heels I left at home. Damn. However, I hope you enjoy this very very very overdue outfit post!